Having recently read and reviewed the novel 'The Viceroy of Ouidah' by Bruce Chatwin, I sought out a film adaptation on LoveFilm. 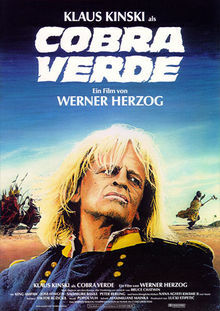 What I found was a German-language film called 'Cobra Verde' directed by Werner Herzog and starring Klaus Kinski as Don Francisco Manoel da Silva. The film, as with the novel, starts in Brazil. We see a dusty and desolate land ravaged by drought. The near silence during those opening scenes followed by the snarling expression on Kinski's face serves well to set the scene for what is, for all intents and purposes, a very dark tale. 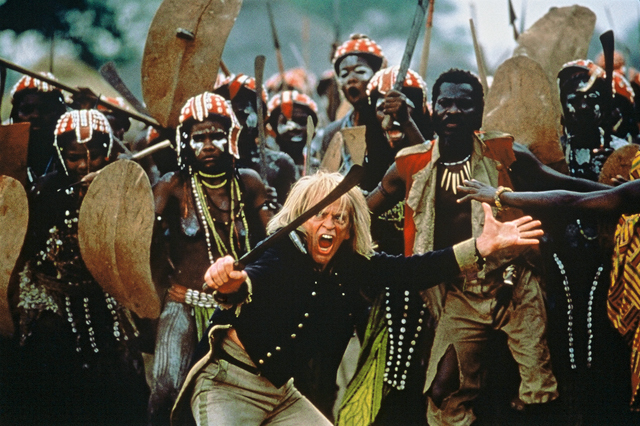 The sense of foreboding in Kinski's face, though, does not then prepare you for how two-dimensional the film's characters and story line become. Chatwin's novel, as I have discussed previously, does remarkably well to weave such a rich tapestry of characters into such a small number of words. Herzog's film falls short of this. Rather than seeing the complexities of da Silva's character and life evolving over the course of the film, we are presented with Kinski's maniacal snarling interspersed with minutes of near-silent mumbling. It is interesting that this film, although wonderfully shot, is called "masterful adaptation of Chatwin's novel" as it deviates so wildly from the novel at times, and yet borrows from the narrative quite closely at others. Perhaps the representation of the King of Dahomey, in all his eccentricity is best captured, but even this character falls flat, just when the audience feels that they are beginning to get a clue about him. To round things off, there are the almost gratuitous scenes of bare breasted African females, playing the role of the Dahomey amazon warriors, followed by a half-naked choir of teenage girls. Yes, there was a regiment of amazons in Dahomey, but their depiction in this film seems at odds with history. The deviations from the excellent novel text are too frequent and so, if we forget that the film is meant to be an adaptation and judge the film on its merits as a film, then I think that this film is as schizophrenic as Kinski's portrayal of da Silva. Herzog, revered by many as a a great director, has in my opinion got this film wrong and any praise should go to the cameramen on this production for some beautiful cinematography.